Erin Lupfer, a third-year USD law student, spoke at the USD Scholarship Appreciation Luncheon on March 30. 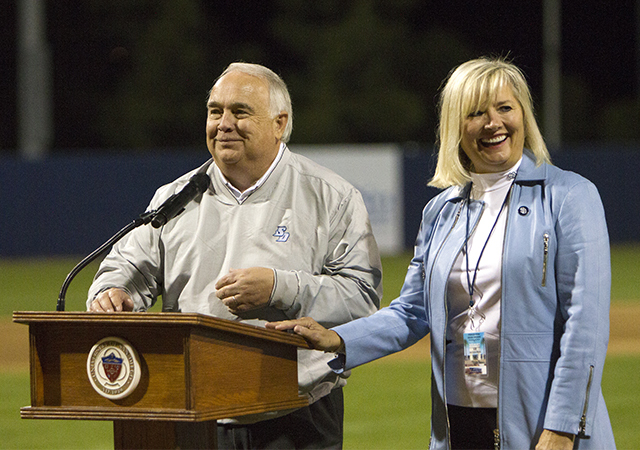 She urged fellow Toreros to support their passions while also helping future Toreros. 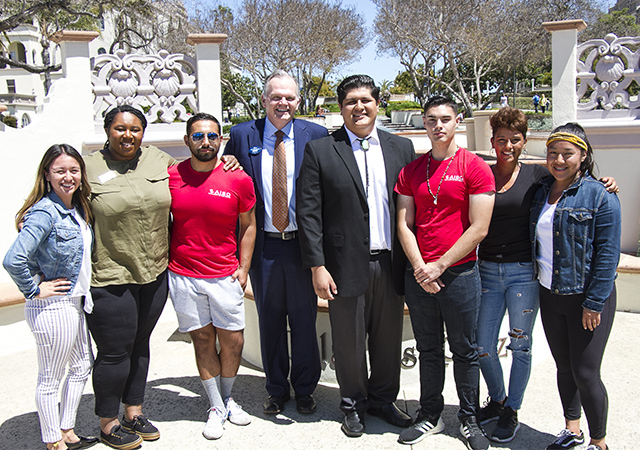 Feelings of thankfulness and gratitude, along with in-person connections, were in abundance throughout the packed Hahn University Center Forum rooms at the University of San Diego on March 30. The 30th annual USD Scholarship Appreciation luncheon provided the latest reminder of the generosity of people. Those who donate to the university are from all walks of life, they do it for a multitude of reasons and they may or may not even be USD alumni. What these people all have in common is an understanding of just how powerful a gift to further one's education is. They want to contribute to another person's path to fulfilling their passion. This year's well-attended Torero thank-you event spotlighted USD's School of Law. 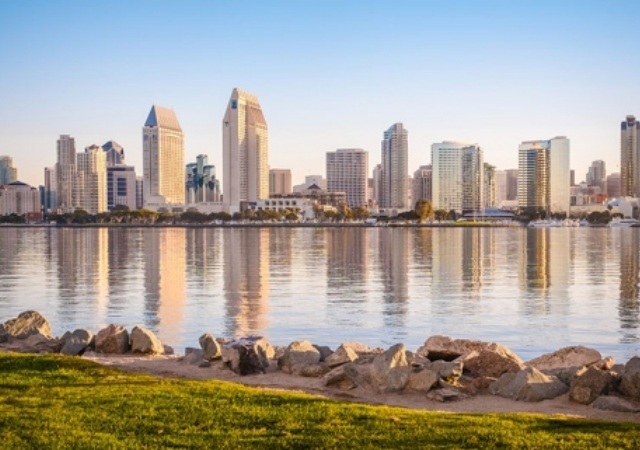 The school, under the direction of its dean, Stephen C. Ferruolo, produces quality, ethical scholars who populate the legal profession in San Diego, Southern California and beyond. What law students and alumni have in common is that they've received a scholarship, often a named scholarship. It's a tangible way for a benefactor to pay it forward and, as evidenced at the luncheon, students thank donors personally and understand the wide impact of the benefactor's supportive example. "When you think about it, named scholarships are limitless, in terms of the people, places, programs and passions that can be supported at this wonderful university," said Virginia C. Nelson, a 1979 law alumna and a benefactor of three law school scholarships: the Virginia C. Nelson Graduation Award in Advanced Advocacy, the Lou Kerig Scholarship Fund and the Virginia C. Nelson and Mark W. Andrews Legacy Endowed Scholarship. Following a video presentation on giving and receiving a named scholarship, 1975 USD Law alumnus Susanne Stanford and 2017 graduation candidate Erin Lupfer each spoke on what it means to participate in paying it forward. Stanford, part of a group of benefactors for a School of Law Class of 1975 Endowed Scholarship and who also has an endowed scholarship in her name, never forgot the generosity she received when she entered law school as a student in 1972 during the most difficult personal time of her life. Her husband, only 31, passed away unexpectedly, just as she was going to start law school. The couple had two infant daughters at that time. She was devastated. "You can only imagine what a total mess I was, but I'm here to tell you that USD saved my life," she said. Stanford was awarded a full academic scholarship. She was grateful for the compassion and encouragement of law faculty members who helped her develop her passion to practice law as a career. "That scholarship meant so much to me and to my girls," she said. "And it was at that moment that I knew I would always give back to USD." It didn't take her long to figure out what to support. "I looked around at the legal community and I was actually shocked and stunned how it absolutely did not reflect the composition of our community and society at large. I knew then that my donations would be made to provide education for the underserved and underrepresented." Years later, she was told about the creation of a special scholarship in the law school and if she'd want to support it. Stanford enthusiastically said yes. Today, her scholarship states that it supports "students who contribute to the diversity of the law school cohort." “it represents that we are a caring community, that we are an inclusive and welcoming community,” she said. That caring and supportive nature exists among USD's current law students, too. Erin Lupfer is a past recipient of the Max and Gussie Gonick Memorial Prize for Academic Excellence in the First Year. "I've received an overwhelming amount of support through the law school, including scholarships like the Gonick Prize, and that support has inspired me to try and find ways to support my areas of passion at USD Law. But even though I've enjoyed the entire USD law school experience, what stands out above the crowd is my passion for VICAM, the Vis International Commercial Arbitration Moot." Each year, Lupfer said, USD's student chapter sends four students to Hong Kong and four to Vienna, Austria, to compete in the Willem C. Vis International Commercial Arbitration Moot. "It's a wonderful experience where we as a group work together on a shared goal that will serve us not just in this competition, but throughout our lives and careers," said Lupfer, the current USD VICAM president. The mission of the VICAM team is to foster the development of international legal writing, arbitration and oral advocacy skills among its members; promote professionalism and academic excellence; employ the talent and coaching of the faculty; maintain USD Law's outstanding reputation through international competitions; and to keep pace with the advancements of international law and commerce. Lupfer had two goals as president this year. One was to do an alumni outreach to previous VICAM-connected USD students to meet with current USD student members. The other goal was to fundraise to send eight students to the international events. A matching gift challenge was issued to VICAM alumni and together with what students collected, the total was over $10,000. But Lupfer took it a step further. "We needed support and we received a lot of wonderful support, but we also have members on our team who don't get to travel internationally and it's important to me that everyone have the opportunity to compete, have the same experience as we do, help them as individuals and the program as they continue their law school careers." As a result, Lupfer said two additional students will attend a competition in Miami. "The experience will help them prepare for personal advocacy and, as second-year law students, their experience helps our program get stronger," she said. Lupfer's words serve as a reminder of the impact students can make on fellow classmates and for future Toreros. "We went through this fundraiser because we were passionate about a program we loved and it has been formidable in our law school experiences," she said. "So, students here today, I encourage you to think about what drives you here at USD. Be it a team, a program, a course, or a club, start thinking now about ways you can support that program to make sure that these opportunities available to you remain available for future students. Thank you to the donors for creating opportunities for us that will not just shape us here, but as we go forth into the world."